Note: The information in this post is a little dated! Artisan and Historian are still great pieces of software, but they are now owned and managed by the company FOREVER. I’m an ambassador there and would welcome any questions you have about it! 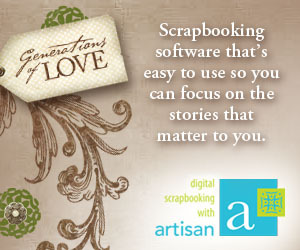 Did you ever try the Creative Memories software for photo organization/editing and digital scrapbooking? I LOVED using StoryBook Creator and Memory Manager!!! In fact, I have loved it and missed it so much since then that I finally went ahead and signed up as a Panstoria affiliate. Panstoria is the company that now supports the software that used to be called StoryBook Creator (now called Artisan) and Memory Manager (now called Historian). These programs are pretty much exactly the same as the most recent StoryBook Creator and Memory Manager programs that Creative Memories used to have, so I’m stoked to get back into them! They are both SO easy to use. I LOVE IT! I have a couple years worth of photos that I haven’t been backing up…so keep your fingers crossed that I don’t lose them before I can get everything into Historians! Mostly, though, I’m SO looking forward to importing all my old Creative Memories content (Artisan lets you use your CM digital content!!!) and getting started designing my invitations, digital scrapbook pages, calendars, and monthly e-newsletter using Artisan. Wish me luck! And feel free to join me by purchasing the software using one of the links in this post or by becoming a Panstoria, Inc. affiliate yourself!